The Vaporesso Ceramic Ccell Coil is a true ceramic coil which provides some amazing benefits when compared to traditional coils. The Vaporesso Ceramic cCell Coil is much more resistant to "dry hits" and/or giving off that ever so dreadful burnt taste! The Vaporesso Ceramic cCell Coil is a unique coil as it incorporates a ceramic layer surrounding the coil wire and there's nothing like it on the market currently. The design of this cCell coil may truly be a revolution in vapor technology offing up the next level in consumer vaping experience and product durability. CCELL Vaporesso Replacement coils, compatible with some Vaporesso Tanks, Atlantis and Triton Tank. 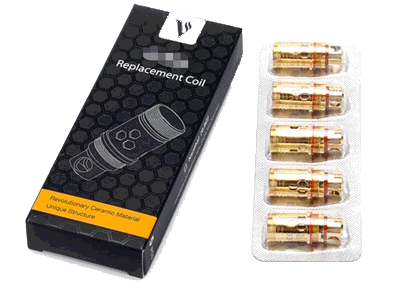 Coils are sold as singles, choose quantity 5 if you need an entire pack.